Taiwan claims him. China wants him. 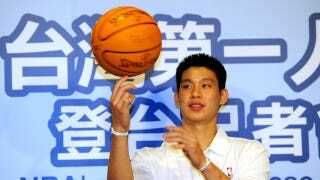 More from The Wall Street Journal: "Taiwanese think of Jeremy Lin as…a son of Taiwan because his parents came from Taiwan and now Chinese television is making the same claims, saying he's from Zhejiang or some place," [journalist and basketball blogger Chris Wang] said. "This is crazy but it's normal at the same time, because it's happened so often in the past." Too bad, y'all. He's 'murican.